Catch the San Diego Padres take on the Colorado Rockies at Petco Park! Game day events and promotions include: Thursday – College Night; Friday – Theme Game: Marvel Super Hero Day, Party in the Park: CocktailFest, Mystery Ball Fundraiser; Saturday – Beach Hat all-fan giveaway, Theme Game: Pacific Islander Heritage Night, Mystery Ball Fundraiser; Sunday – KidsFest, Friar Family Day. One of the top 20 “Must See” seaside festivals in the world according to American Express and USA Today’s 10 Best, the U.S. 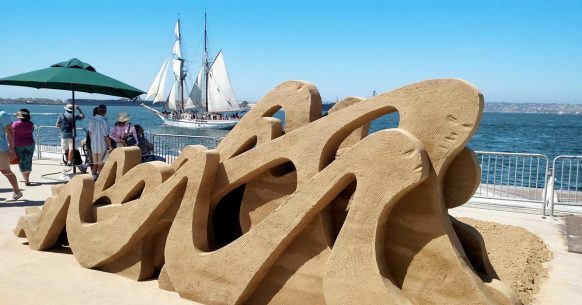 Sand Sculpting Challenge and Dimensional Art Exposition will return to San Diego’s downtown waterfront for 2018. This will be the seventh year that one of the world’s most important sand-sculpting competitions will be held on this built-for-the-occasion beach, with over 300 tons of sand dumped on the pier on San Diego’s Big Bay. The 7th annual edition will be open to the public Aug. 31 – Sept. 3. The Port of San Diego is again Presenting Sponsor, as the event is held on its beautiful Broadway Pier and Landing. So come and celebrate Labor Day on the Bay with us. Our glorious summer winds down but not before the cannons and fireworks light up San Diego Bay to Tchaikovsky’s awesome ‘1812 Overture’. Join us as we celebrate summer’s end in spectacular style! The Labor Day Stickball Tournament takes over a the streets of Little Italy and allows players to revisit some childhood memories. Julian’s Grape Stomp Festa is a great way to spend a Saturday and this year’s is shaping up to be one of our best. With ten local wineries offering sips to sample, a wide variety of food and shopping opportunities, great Italian music provided by Roman Holiday, Bocce Ball Court, a little extemporaneous dancing here and there, this will be a party to remember! Surf beyond your expectations as the sea comes alive at night and dive into Electric Ocean, SeaWorld’s fantastic summer nighttime celebration.